It starts with a metaphor. Losing a job and searching for new work can be one of the most difficult experiences we face in life. These are moments when we can feel at sea —lost, overwhelmed, lonely, and worried that we might not be able to make it through to the other side. Our aspiration is to be the tugboat professionals need in these moments. Small but powerful. Slow but steady. A sign that help is on the way. A guide back to the safe shores of work when one is needed most. At Project Tugboat, we believe that most of the services devoted to helping professionals through moments of career transition and interruption are focused on the wrong thing. The journey back to work has two types of challenges: tactical and social-emotional. The tactical challenges consist of all of things that you’ve been told time and time again that you have to do “just so” to successfully find new work. An entire “career industrial complex” has emerged around the tactical challenges of job-searching. Every day there is a new coach or outplacement service that will claim to solve every one of these challenges for you. All of this has created the illusion that if you just do more of the tactical in more sophisticated ways, you’ll find work again. The reality is that it’s just not that easy. Overcoming these tactical challenges is necessary but not sufficient in the journey back to work. What makes the difference between someone that feels they are conquering their career interruption and someone that feels they are being conquered by it? It’s how well they handle the social-emotional challenges. These are the questions that Project Tugboat helps you answer. How we manage ourselves in moments of career transition matters much more than the career industrial complex would have you think. 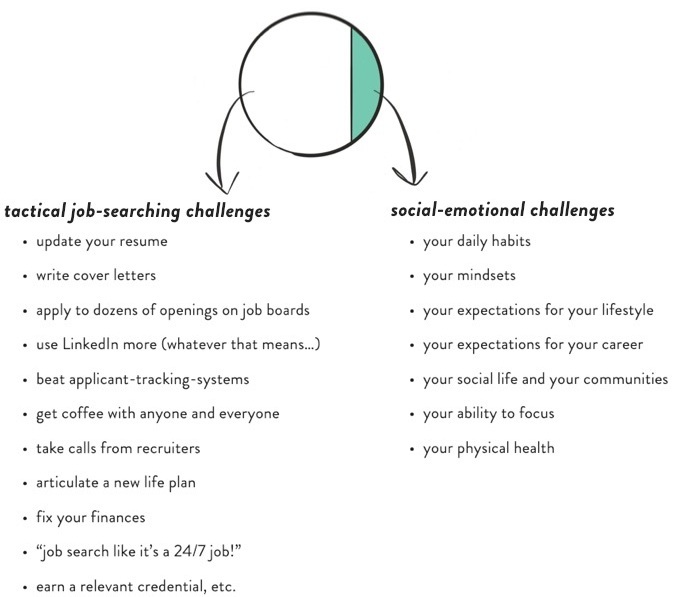 Our habits, our mindsets, our expectations, our social lives, our ability to focus, our physical health — all of these social emotional challenges matter a great deal more in the journey back to work than the tactical challenges listed above. We recognize that finding new work in the 21st century isn’t just a matter of becoming the Buddha of job searching. You do have to be smart and savvy as you navigate through the tactical challenges even if you have a handle on the social-emotional ones. It’s all about balance, and for us at Project Tugboat, that means rebalancing support to help professionals overcome the myriad social, emotional, and behavioral challenges unemployment prompts. Project Tugboat’s resources and services leverage a unique combination of labor market intelligence, human-centered support, and behavioral science. The result is the future of career guidance. Are you… an investor curious about what we are up to? … an expert in behavioral science, product management, or counseling/coaching and want to change the “career industrial complex” for the better? Send us a note! Thanks for your interested in what we are doing. We’ll be back in touch soon!